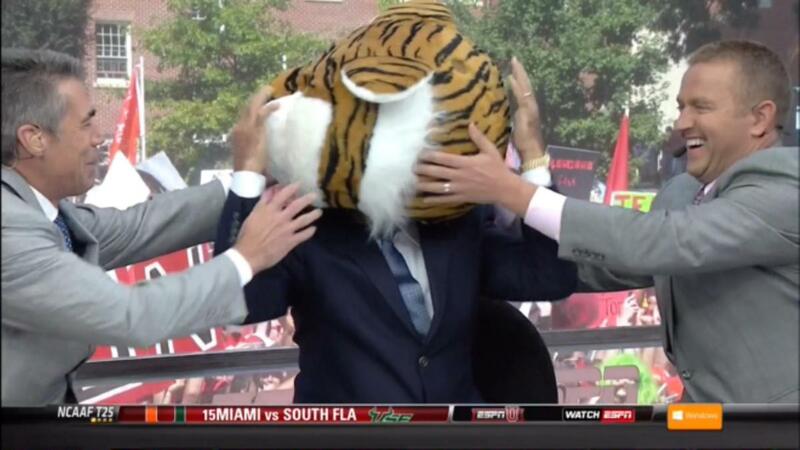 I did want to comment on LSU briefly being that both Lee Corso and Kirk Herbstreit picked the Tigers to make the NATIONAL championship game (I recognize this may be bad news for the Tigers). Desmond Howard picked Texas A&M to win the SEC. I’ll talk more about the Aggies later, but his basis for that was adding John Chavis as the DC to Sumlin’s offense, so I’ll respond to that briefly. Chavis did a good job overall at LSU, but this past year was one of his poorest performances. Even if he’s not losing his touch, I don’t think he’ll suddenly conjure up a good defense in College Station. The panel was unanimous about someone from outside of the state of Alabama winning the SEC West, so I hope they’re right (but if it comes down to Auburn and A&M, I’ll be for Auburn). Lee Corso (center) picked LSU as the national champions, and Kirk Herbstreit (to his left) picked LSU as runners-up to Ohio St.
11. Ole Miss 15 – staying in the SEC with this one. Even if LSU does fine the rest of the season, it’s going to be awfully hard to win the divisional road games at Oxford and Tuscaloosa. The Rebels have never won the SEC West (unless losing the head-to-head tiebreaker in 2003 counts), but with 16 starters back from a contending team last year, this could be the year. It’s also quite conceivable there could be some sort of tie with the Rebels making the SEC title game this time. Bo Wallace does not return, but that could be a blessing as much as a curse. 12. Florida St. 2 – I don’t know if this is too high for the ’Noles given my deep skepticism of both sides of the ball (as noted in the top 10 blog), but a fall in more than 10 spots for a team that’s been near the top of college football for a couple of years seemed like too much. Don’t be surprised if they finish a bit lower though. 13. Georgia Tech 10 – I had the Wreck as a top 10 team at the end of last year. While they don’t have an overwhelming number of returning starters (13), they were right there with Florida St. last year, so I see no reason to expect otherwise this year. 14.Notre Dame (33)– The Irish will have to play three teams mentioned above (USC, Ga. Tech, and Clemson) as well as Stanford, but I don’t hold schedules against teams in preseason. I don’t think they were actually better than LSU last year, but they did show significant improvement that made the bowl win possible. Also, almost their whole team (19 returning starters) is coming back. I can easily see the Irish in the top 4 even with a loss, but this may depend on the perceived strength of the Pac-12 and the ACC at the end of the year. 15. Arizona St. 19 – The Sun Devils have nearly as good of a chance to win the Pac-12 South as UCLA and USC do, but they never quite seem to have the consistency to do such things. They did make the Pac-12 championship in 2013, but the highest-ranked team they had to beat to do so was #14 UCLA. I don’t think it will be the same type of thing this year. They haven’t beaten a team ranked higher than that since 2002, and they also can’t do things like lose to Oregon St. (as they did last year). ASU does return 16 starters from a top-20 team, however. 16. Boise St. 5 – I always have to remind people that unlike the human polls, I do not routinely just move teams up for not losing. This makes it less problematic to put a team like this in the top 20. The Broncos return 16 starters from what I had as the #5 team last year. Teams like this have been ranked in the top four at the end of the year in the BCS era; and now that four is the magic number, it may just be a matter of time. They do have a new quarterback, but that was also the case in 2012 (11-2) and 2008 (12-1). 17. Georgia 13 – The Bulldogs did well enough at the end of last season to earn this spot even though they don’t have a huge number of returning starters (12). I’m still not quite sure how they managed to lose to Georgia Tech, but the Auburn game and the bowl game were very impressive. They couldn’t win the SEC East in the last couple of years, and it won’t exactly be easy considering they play Alabama and Auburn, but I still give them a slight edge over Missouri. 18. Wisconsin 14 – I see the Badgers as a potential spoiler in the Big Ten championship (Ohio St., Michigan St., and Michigan – none of whom they play in the regular season – are all in the other division). They’ll have a new running back or two, but that’s one area they never seem to struggle in finding new talent. The defense should be strong with 8 returning starters on that side. They might not be fun to watch, but 10 wins or more seems probable. 19. Missouri 11 – The Tigers were a better team overall last year (still not sure what happened with Indiana) than the Badgers, but I don’t know if 13 returning starters is enough. I’ll talk about this more below when I discuss teams that didn’t make the cut. That being said, they could easily go into the season-ending Arkansas game with a chance to make the SEC title game once again. 20. Auburn 21 – Once again with this section of teams, the question is going to be consistency. They had great games (41-7 win over LSU, for instance) and not so great games (34-7 loss to Georgia). I don’t know if that’s suddenly going to turn around with a mediocre number of returning starters, which I mentioned in the top 10 blog. The Plainsmen do supposedly have a good new quarterback, but he’ll have ample opportunity to prove it. 21. Arkansas (38) – Staying in the SEC West, the Hogs seemed to turn the corner late last year and had an excellent chance to finish the SEC schedule with a third straight win after shutting out LSU and Ole Miss. Mizzou upended them late, but I certainly expect the Razorbacks to win some similar games this year with 15 returning starters. 22. Stanford (32) – The Cardinal were supposed to have a great offense line last year, and I didn’t even rank them in the top 30 and the end of the year, so I’m more tepid about them than a lot of the preseason ratings are. They should have a strong offense with 9 returning starters though. I’ve seen some hand-waiving over the lack of experience in the defense, but look at the Pac-12 teams I’ve mentioned above and Notre Dame. I could easily see several games where the defense struggles to keep up. 23. Oklahoma St. (58) – The Cowboys weren’t very good last year, but they won 10 games two years ago and 12 games two years before that. Maybe they just like odd years. They certainly showed flashes of talent last season, and they do return 16 starters. They could be a sleeper/spoiler team in the Big XII. Don’t forget that TCU’s performance last year was after a 4-win season in 2013. 24. Oklahoma (36) – While we’re talking about the Sooner state, why not talk about the Sooners? They were a disappointment to the faithful last season, I’m sure, but nearly beat TCU and Kansas St. and had other good games. Again, it’s just another team that struggled with consistency though. A more modest number of returning starters though (13), so they might not be able to hang in so well against TCU and Baylor and so forth. 25. Texas A&M (31) – The former divisional rivals of those Oklahoma teams will probably struggle to contend in their current division, but they have 15 returning starters evenly distributed on both sides of the ball and apparently some stability at quarterback, so they could be dangerous. I would understand if people want to stop reading there, but I thought it was worth addressing why certain teams do not appear above. Despite being a top-10 team most of last season, Mississippi St. only has 9 returning starters, which puts them among the lowest in FBS football. I don’t think they’re a good candidate for the preseason top 25. Just because they had a good year doesn’t mean they had Ohio St. and Alabama level backups standing on the sidelines waiting their turn, but I guess we’ll see against LSU in a couple weeks. Marshall only had a couple more with 11, and I’m really skeptical they had a great second squad last season. Another team I wanted to mention who didn’t make the cut is Arizona. I just them as fading at the end of the season, and they don’t have impressive numbers coming back. They could be in the top three of their division with some luck, but I don’t see the upside for them being much better than that. The downside is they could be a low-level bowl team (or worse) who struggles with the likes of Utah. Kansas St. is pretty much in the same boat. The Wildcats also have 12 returning starters and finished in the top 25 last season, but it’s a similar profile. I don’t think the upside is all that strong even if things go well. The teams I have ranked can win their respective conferences if things fall into place. I just don’t see that with this group. Colorado St., Northern Illinois, and Memphis were also in my final top 25. Even if they had a lot of returning starters, I probably would not have ranked them. This is a bit of a tangent, but I’ll explain why below. I don’t think they were better than many of the 26-40 teams that were in major conferences. It’s more that the philosophy of my rankings focuses on top teams so it is set up to remove those with four or five losses from consideration more than a team with a small number of losses who doesn’t play anyone. I’ll give an example. Team A is in a major conference and is 7-4. Team B is in the MAC and is 10-1. There is a good chance Team A is better than Team B. Two slightly worse teams last year demonstrate that. Northern Illinois lost to Arkansas, 52-14. Arkansas finished 7-6, and NIU finished 11-3. Going back to the hypothetical, what if the following happens? Team A then beats two top ten teams and goes to 9-4. Team B then beats two top ten teams and goes to 12-1. Team B would be ranked higher for sure. Even though the season will almost never end like that, I still don’t want it to penalize easy schedules so harshly that if you do add a couple of really good wins that the team can’t then be in the top 10. Anyway, the point is that such a team being ranked last year doesn’t mean they actually would have beaten Stanford, Notre Dame, LSU, Oklahoma, etc. Finally, Tennessee wasn’t ranked last year and barely made the top 50, but they have almost their whole team back with 18 returning starters. I just think you need to have a better team to start out with for that to matter enough. The Vols were very fortunate to play in a bowl game at all. The same is technically true of Arkansas; but like I mentioned, Arkansas dominated their last two SEC West opponents and nearly beat the SEC East champions. If Tennessee had played in the West, they probably would have finished last and not made a bowl game. About a month before Arkansas beat Ole Miss 30-0, Tennessee lost to the Rebels 34-3. Also in the last month of the season, the Vols only beat South Carolina by three (in overtime) and Vandy by 7. Tennessee had a respectable performance against Alabama (losing by 14) and dominated Kentucky before beating Iowa in the bowl game, but that’s not enough to change my perception that they’re still an unproven collection of players. The Week 1 top 25 won’t be until Tuesday, that’s one reason I waited until today; but after that, it should be on Sundays pretty regularly. There has been some confusion on this in the past, so I wanted to start with my general philosophy on pre-season rankings. I do use a formula starting around the beginning of October for ratings, but that has nothing to do with pre-season. Everyone starts fresh in that formula when we get around to it. What I start with is a subjective evaluation of how good the team was last year and how many good players are coming back. If 17 of 22 offensive and defensive starters are coming back from a top-10 team, that’s probably going to be a good team, at least they’ll be well-positioned. It might not be the best team, but to me that’s a preseason #1 candidate. That team would go ahead of a more talented but unproven team. I wanted to say a couple of things about returning starters. I know how many returning starters you have in August aren’t always great predictors of how well you do in November, December, and January, but I still think they’re a good place to start. A preseason top 25 should be the teams you expect to be strongest based on what the teams have to start the season. Likewise, when you get to the end of the season, subjective polls will reflect who’s good at the time and might not count those early-season games (such as the one Ohio St. played against Virginia Tech last year) for much. I guess the best analogy for my preseason approach is seeding or pole position. It’s an earned status to a degree, but it’s not necessarily a prediction of results. An example from the NCAA basketball tournament a few months ago was Villanova. I didn’t really have a problem with them being a #1 seed, but I still thought there was a good chance they’d lose in an early round and they did. The previous year, that’s how I felt about Wichita St. When I do talk about returning starters below, I am just referring to Phil Steele’s list of returning starters and not counting kickers… not that I don’t respect kickers, but few championships are decided by having an experienced punter or kicker rather than just having a good one. I wouldn’t bet Ohio St. over the field, but if someone wants to finish #1, they might just have to take it from the Buckeyes themselves. I have a couple of guidelines for preseason #1. One of these guidelines is that it has to be a team that I’ve previously ranked #1 in my 20 years (this is actually year 21) of ranking college football teams. So while either TCU or Baylor could emerge from the Big XII and win it all, I can’t really pick either one. I do want to say one other thing about the Big XII upfront. I think there will likely only be one of the two in the playoff (same thought about the Big Ten, by the way), and the likely fourth team I would guess will come from the Pac-12, but I obviously don’t think any Pac-12 team looks good enough for the top four just yet. Unlike some, I don’t necessarily gravitate toward last year’s #1; but I just don’t see any other good choices. For the record, this is the fourth time I have made the Buckeyes my preseason #1. ESPN’s #3 is Auburn. I wouldn’t be surprised if Auburn finished #3 (or maybe even #4) in their DIVISION. Alabama, Georgia (who Auburn plays every year despite being in another division), LSU, Arkansas, and Ole Miss are not exactly strolls through the park when you return only 12 starters from a four-loss team. Alabama has been a safe high pick in recent years, but another new quarterback (and not an experienced veteran new QB like last year) is a concern. Also, this has happened a few times, but Alabama was lucky it finished with the record it did. Whether you fault LSU or the refs for the outcome, Alabama’s talent did not really win that game. I also felt Auburn played a better game, at least between their own goal line and about the Alabama 10. So I wasn’t shocked when the Tide lost to Ohio St. I didn’t pick Ohio St. to win, but I wasn’t shocked. The other two teams from the top 4 last year were Oregon and Florida St.
Oregon only returns 12 starters and only 5 on defense. I think defensive returning starters are often underrated in preseason rankings. Offensive returning starters depend a lot more on position and player. A tight end or guard might not be missed, especially if there is someone else there who had significant playing time before; but any weak link in a defense, even if it’s only week for a couple plays in the game, will be noticed. Florida St.’s offense will be gutted. If the 4 starters were Winston, a couple of linemen and a good wide receiver, that would be one thing, but Winston is gone and the ’Noles replace four linemen. Defensive starters are underrated as I said, but it helps to have a defense less pourous than their was. FSU only had 11 returning starters two years ago, but I think we know enough about Everett Golson at this point to know he’s no Jameis Winston. I haven’t followed the team that closely, but I certainly don’t think the other candidates are clearly better than he is. There may be a potential top-four team I haven’t mentioned that could surprise and win both games (like Ohio St. did last year), but to go along with what I said earlier I don’t see preseason rankings as the time to make longshot predictions. ESPN also has USC, Michigan St., and Georgia in the top 10. USC can beat Notre Dame and they can beat Oregon, but I’d be pretty surprised by both, especially given that both are on the road and USC hasn’t won anything major in a while. Also, there is that whole conference championship thing, and UCLA and Arizona St. won’t be cakewalks either. Michigan St. is interesting. They were a top-4 team a couple of years ago. I don’t think they’ll play anyone overpowering with the possible exceptions of Ohio St. and Oregon; but I don’t know if their QB will have anyone to throw to, and they also fail the #1 test I mentioned above. Their #10 is Georgia. They play those Alabama and Auburn teams I discussed (pretty tough inter-divisional slate), not to mention that Missouri team that keeps winning their division and an improving Tennessee team (also the man in the visor isn’t a pushover either). They also have 12 returning starters. Now I think the SEC will have at least five top 25 teams, possibly even two or three more, but I don’t see a team that jumps out much. If I’m anywhere close to correct about the SEC, it would take the best coaching performance Saban has ever had for Alabama to get through undefeated, so I don’t think that’s going to happen, especially given that game against Georgia. On the other hand, since they found a way to win all but one last year (before the playoff), they can probably do the same this year and end up in the top four. Of course LSU lost two games in 2007 and ended up in the top two, so top four certainly isn’t out of the question with two losses. Baylor is #2 because look how good they were last year with single-digit returning starters. They have almost twice as many this year. They really are one of the top two teams I wouldn’t want to play, especially early on. The main worry with the Bears is they could get in one too many shootouts, and it could backfire, like that WVU game that got away from them last year. The defense should be improved, but there is a lot of room to improve. I was going to pick Oregon as my top Pac-12 team again, but Phil Steele convinced me otherwise. I think I jumped the gun by picking USC to do so well last year (#11 was my preseason ranking), but that doesn’t mean they won’t move up this year. They have better pieces in place, it’s just a matter of how quickly the team gels and learns how to be champions. The Trojans may not even beat Oregon (on the road), but even if they don’t, they could get a second chance. Both could easily have out-of-conference losses as well (to Michigan St. and Notre Dame, respectively), so the Pac-12 should be less confident about landing a playoff team than the SEC, Big XII, or Big Ten. I also don’t think UCLA is far behind. Like with USC, I wonder if they can go from challengers to champions, but I also think the talent and potential are there. The quarterback is a question mark, but he’ll have enough support staff around him that by the time they play the likes of Stanford and especially USC, they could be a very good offense. Clemson has three tough games: Notre Dame, @Miami, and Florida St. If they win all three and the ACC championship, they should be in the top four. I don’t think they will, but top 10 isn’t too much to ask. The defense (4 returning starters) may have a rough time of things, but I don’t think Florida St. and Miami will have the kind of punishing offenses to take advance of it too badly. LSU is a good place to end because for one I honestly think they’ll be more competitive in the SEC this year, and because I can finish this blog by talking more about them without detracting from other teams. I really tried to look for reasons not to put LSU in the top 10, but my main concern with the defense is depth in the secondary, I’m not concerned with the whole unit like I am with Clemson. Clemson may have a more solid offense and a better QB situation, that’s why they’re higher, but I don’t see much distance there. I think LSU is still too young to do something like win the SEC (though to be fair I didn’t see that coming in the preseason in 2001 or 2003), but returning starters are returning starters even if they were freshmen starters last year. As the cliché goes, they weren’t freshmen when last season ended. If they can do something like, I don’t know, beat Alabama, that could be a springboard to something really special in 2016. I just want to mention something that’s bothering me. People are saying Saban has Les Miles’ number, but two of the past three years, Alabama did not have a good game against LSU. Instead of continuing to run over the defense, LSU played for a field goal in 2012 (which they missed and which started Alabama’s game winning drive). I touched on last season earlier, but LSU had the ball with goal to go and under two minutes left in a tie game. A little mutual physicality after a play somehow got LSU a personal foul (but not Alabama) and stopped the clock. LSU had little choice but to play for a field goal to take the lead. Then LSU’s squib kick on a kickoff (which they might have kicked deep had there been less time on the clock) was a little too diagonal and bounced out of bounds, eventually setting up the tying field goal. I’m not saying not to give Alabama credit for their respective winning and tying drives, but that’s not Alabama or Nick Saban having LSU’s or Les Miles’ number. Now if by “has his number” they mean he’s been getting the breaks, then absolutely; but that type of thing doesn’t typically last forever. The shoe was on the other foot not too long ago. Let’s not forget that last year Alabama had a top-four team and LSU didn’t even have a top-25 team. The game this year is at Alabama, but the road team has a consistent historical edge in the series. LSU last won in Tuscaloosa in 2011 before losing to the Tide in the rematch two months later. So the Alabama win in 2013 was the only win by a home team in the series since 2010. LSU could also easily lose a revenge game to Ole Miss or Texas A&M or possibly lose again to one of the teams who beat the Tigers last year. That type of thing is less likely for Alabama even if they finally do lose one to LSU.